Mars transit in Gemini 2017 will commence on May 27th, 2017. After entering Gemini from Taurus sign, Mars will continue to stay there until July 11, 2017. This celestial movement will trigger significant developments across the world. In this article, we will enlighten you about the impact of Mars transit in Gemini on the natives of different signs. The Cosmic Commander-In-Chief Mars is considered ruthless by nature. Possessing red eyes, Mars is fickle minded but is also characterised by a large generous heart. Mars is said to have a thin body and waist and it controls bones and muscles in the human physique. It resides in fire and exercises control over the day hours. Mars gains Digbala (directional strength) in the 10th House (southern direction). If we talk about taste, Mars symbolises bitter taste. Mars shares a friendly relationship with Sun, Moon and Jupiter; on the other hand, it is hostile to Mercury. Besides, Mars is neutral towards Venus and Saturn. If Mars is becoming stronger in your horoscope then you will be graced with auspicious developments. Mars is also known for providing strong confidence and amazing leadership qualities. The planet also confers huge courage to take things head on. A strong Mars in the horoscope leads to a personality which is discipline-loving, easily believing and enabled to give guidance to others. Mars can give both the good and bad results. Indeed, Mars brings about big changes in the lives of people. Well, as for India, the transit of Mars in the second house from Taurus will present itself with different types of changes. 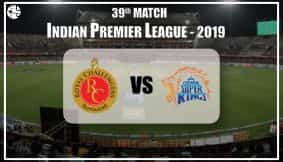 Mars is in the (House of Communication) Speech Area (Vani Sthan) of India's horoscope which is also called the (House of Finances) Money Location (Dhan Sthan) space. Mars transiting via Gemini may cause the tenor of political leaders turning more aggressive. They may not be able to keep a check on what they are speaking. There may be lot many changes on the economic front as well during this Mars transit in Gemini 2017 and the government may bring in new policies to tackle these developments. Likely changes are also foreseen in the laws relating to taxation, etc. There are possibilities of some significant decision being taken by the government on the Education front. Due to Mars traversing and eyeing the eighth house, the government could take some tough decisions. A war like situation may even emerge on the national borders. The government may also have to opt for a tough armed action along the border to restore peace and order during this Mars transit in Gemini 2017. Besides, other issues too may emerge, like water scarcity, fire breakout, a big accident or the death of a big political leader. There is the chance of implementation of a new proposed policy in the IT or Telecom segments. On the global front, again the political leaders may not be able to restrain the tone of their speeches during this Mars transit in Gemini 2017. Irresponsible and aggressive speeches may give birth to war like situations. Due to the misadventure of a few countries, the emerging possibility of a third world war can not be ruled out. Big powers may take unexpected decisions. War like situations may emerge in the Middle East and gulf countries. This Mars transit in Gemini 2017 will bring about healthy results in the lives of Aries natives. Aries natives will be prepared to undertake any act which requires a lot of courage or guts. Mars, the source of bravery, will increase courage in the private lives of Aries natives as it is in the third house of Aries. The problems related to siblings will be sorted out. Aries natives will also get chances of new projects or a new job. They may also initiate new business. As Mars will be aspecting the 10th House of career and profession, you will be able to perform well at the workplace. But, you will have to avoid getting into heated arguments with your colleagues, especially seniors. Are you worried whether these probable arguments will affect your career prospects? Then, Avail the Career Prospects Report and know your future. However, Aries natives are advised to drive vehicles with care and caution as there is the possibility of a minor accident during this Mars transit in Gemini 2017. Avoid any misadventure in the financial matters and exercise caution. Besides, you are likely to spend money for your younger sibling (brother or sister). There is a possibility of an adverse impact of Mars transit in Gemini 2017 on the lives of Taurus natives. You may face unnecessary expenses, so you are advised to move ahead with proper planning in financial matters. However, there is a silver lining. You may find out new sources of income or there may be an increase in your savings. You will have to take care of your parents and other senior citizens in your family. You will have to be careful lest they fall sick. Well thought-out planning will yield good results. You will need to keep a check on what you speak else you may hurt somebody unknowingly. During the Mars transit in Gemini 2017, the possibility of you spending money on your permanent property can't be ruled out. There is also a chance of acquiring property via inheritance. Will the property acquisition enhance your overall wealth prospects? Get the answers with the Wealth Ask A Question Report. 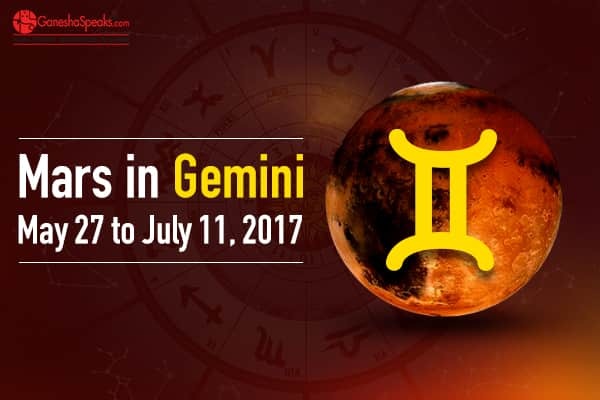 The natives of Gemini sign will gain good benefits due to this transit. An increase in your enthusiasm and anger is also foreseen. You will show the courage to implement your new ideas during this Mars transit in Gemini 2017. In business, you will be motivated to try something new. You will be able to complete your pursuits by your hard work. Will your efforts bring good results in business? Buy the 2017 Business Report to get guidance for business. Blood pressure patients will have to be careful as there are chances of wide fluctuations in BP. Ganesha also wants you to be very careful about your health lest you fall into some minor illness. You may also win fame and glory. You may come across something really very exciting during this period, says Ganesha. The natives of Cancer sign will need to be extra cautious during this Mars transit in Gemini 2017. As Mars is traversing your twelfth house, so you may be pushed into a difficult situation. There is also a possibility of you incurring big expenses. You may feel confused while pursuing your financial plans. You may also incur hospital related expenses. You may have to bear more than the expected expenses for arranging some ceremony at home. Due to business reasons, you may have to travel out of station. A likely foreign visit is also foreseen during this Mars transit in Gemini 2017. If you will make an application for a longer stay in a foreign country, then Ganesha predicts you are likely to get successful. Your interest in spiritual and complex subjects is likely to go up. As there is a possibility of making losses in business, so you should move ahead in an intelligently planned manner. The matters related to Court may acquire importance in your life. You may have to opt for the legal route in certain matters. Will such problems affect harmony in your personal life and affect your relationships? Get 2017 Personal Life and Relationship Report to find out. The natives of Leo sign too will stand to gain during this Mars transit in Gemini 2017. There is also a possibility of businesspersons making gains in their profession. Their tasks which have been lingering for some time will get accomplished without obstruction. Relationship with friends too will get more intense and you will get benefited by your friends. You may even make new friends. Auspicious developments will take place on the home front. There may be some developments at home related to your elder sibling. Your respect and recognition are likely to go up during this Mars transit in Gemini 2017. You will get the happiness in public life. You may also get a happy solution to a Court issue, sees Ganesha. Besides, your long term plans will yield benefits or you may get from them double the money which you had invested.Do you have some concerns about matters related to investments, speculation or even stock markets? Buy the Investment Advice and get clarity. This transit holds a lot of significance for the natives of Virgo sign. You are likely to win in certain areas by virtue of this transit. There are strong prospects of changes happening. Your recognition and prestige are also likely to go up during this Mars transit in Gemini 2017. Circumstances may lead to an expansion in your business or commerce. The transit of Mars in the 10th House can infuse great enthusiasm and energy within you to perform well, but it can make you impulsive and restless. Due to this factor, you may get confused whether you should try your hand at business or continue in job or vice versa. But according to the planets, what is destined for you? Buy the Job or Business Report and get answers. Job holders may get a better opportunity. You may gain new friends amongst the government officials which may help you in your business or profession. You are suggested to be careful about your father's health. Your may meet new people who may help you financially. Overall, the time period will be good for you during this Mars transit in Gemini 2017. Mars while transiting via Gemini will pass through the ninth house or Luck space (Bhagya Sthan) for the natives of Libra sign. This will create chances of long journeys. The lord of Money Space Mars transiting through your Luck Space will make you lucky in matters of money and finance. Your luck is likely to make you gain in financial terms during this Mars transit in Gemini 2017. You are likely to make benefits in business as luck will be on your side. You will also make expenses while undertaking spiritual pursuits. Do the positive developments mean a sound financial position in 2017? What do the other planetary configurations indicate? Buy the 2017 Finance Report get detailed insights about your finances in 2017. A desire to try something new will be born in you and are also likely to get a new opportunity. You may also gain in a foreign visit which you undertake. Ganesha is also foreseeing strong chances of you going out with your family members on a long trip during this Mars transit in Gemini 2017. This Mars transit in Gemini 2017 may create some problems for Scorpio natives. The transit of this planet from your eighth house may create sudden death-like circumstances in your life. So, to avoid any eventuality, be very careful while driving a vehicle or other such difficult situations. You may also experience sudden gain or loss in money due to the planetary positions. The legal issues which you are facing in life are unlikely to be resolved during this time duration. Move ahead with utmost care and caution as malefic Mars is in your eighth house. On the whole, the time duration of this Mars transit in Gemini 2017 may be a mixed bag for the natives of Scorpio sign. These predictions are based just on the transit of Mars. But, what do the planets indicate about your life overall? What's written in your destiny? Find out all about your life with Detailed Life Predictions report. This Mars transit in Gemini 2017 holds a lot of importance for the natives of Sagittarius sign. As Mars is transiting via your seventh sign, natives will have to be careful about their partnership issues. There is also a chance of some dispute emerging between businesspersons and their partners. So, businesspersons should try to maintain a harmonious relationship with their partners, else ties with their partners may come on the verge of breaking. You also need to be careful in your married life as sensitivity therein is likely to increase. The health of your life partner may deteriorate during this Mars transit in Gemini 2017. The discussions with your partner may turn into a heated argument. As you both may get annoyed with each other, there is also a chance that you may stop talking to her or him. Don't let conflict spoil your married life. Besides, you may have to frequently visit Court due to unfavourable planetary positions. You may also face hurdles or problems in public life. Your enemies may be looking for opportunities to hurt you. Are you feeling worried about certain aspects of life? Then, you can get answers to all your questions. Buy the Ask Any Question Report and get expert guidance. This Mars transit in Gemini 2017 in your sixth house may cause your health to deteriorate. Some old ailment may resurface and cause you a painful situation. Your enemies may try their level best to hurt you, so be on high alert. There is also a sad possibility of your maternal uncle becoming ill or the sad news of somebody's death from your maternal native place. Planetary movements may cause the circumstances of an operation. Those who are doing jobs may get harassed by their seniors. As the possibility of you getting caught in a loan trap is foreseen due to Mars transit, so you are advised to plan your finances in an efficient and intelligent manner. Ganesha advises that if you make a sound financial plan, your situation will continue to stay healthy during this Mars transit in Gemini 2017. The 6th House in the Horoscope represents employment and related matters. Thus, during the transit of Mars in the 6th House, there may be some new developments at the workplace or new issues may crop in your career. Buy the Career Prospects Report to get detailed insights. As Mars will be transiting in your fifth house, so it may be a little worrying time for your child's health. You should be alert about your offspring's health as the undesired planetary positions may impact it adversely. As students are likely to experience a decrease in their memorising power and understanding ability, so they are advised to work hard in a focused manner in order to attain success. Besides, a mutual difference of opinion may prevail in the love relationship between the lover and the beloved. Your impolite words or undesired behaviour may hurt your partner, the planets are foreseeing during this Mars transit in Gemini 2017. Feeling anxious about certain issues in your life? Will these issues affect your life in 2017? Buy the 2017 Ask Any Question Report to get clarity. If you want your relationships to stay sweet, you are suggested to maintain politeness and discipline in speech and behaviour. Those lovers who are planning to propose should wait until July 11, 2017, else they may get a negative response. You may develop a special interest in occultism (tantra-mantra) during this Mars transit in Gemini 2017. Due to inauspicious positions in the context of share market investments, you are suggested to stay away from such investments. You may have the desire to earn a lot of money in a short time, so you are advised to go ahead with a lot of intelligence and discrimination. Mars transit in Gemini 2017 will have significant implications for the natives of Pisces sign. This transit holds big importance for the issues related to your property. There will be forward movement in your property related issues or you may be able to take some concrete decisions in these areas. The time duration is auspicious to buy or sell a new property. But as Mars will become malefic so you will need to stay away from carelessness in any transaction. The time is also good for buying a new vehicle. Due to the inauspicious situation of Mars, your mother's health is likely to deteriorate. Mars which is moving from Sukh Sthan (Well Location) may create confusion in your mind. You may also have to stay away from your home and family and you may even be transferred to other cities. In this crucial duration, Pisces natives will have to be careful in their every act during this Mars transit in Gemini 2017. During its transit through the 4th House, Mars also aspects the 7th House of marriage and spouse. As Mars is a planet of passion, it may push you to ignite the spark with your spouse. But, it would be better to keep control over your impulses, as this may spoil the mood. But, what do the other planets indicate about your personal life? Buy the 2017 Personal Life & Relationship Report to get answers. 3) How does planet Mars influence us?